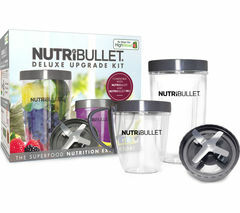 The NutriBullet is a superfood nutrition extractor that’s kick-started a whole new health revolution. NutriBullet blenders are powerful enough to whiz up the smoothest smoothies, making it easy to get a powerfully delicious dose of fruit and veg every day. 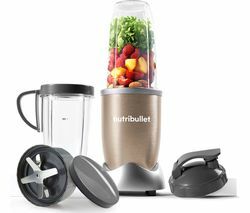 NutriBullet blenders have powerful food-liquefying properties that enable them to turn even the heartiest vegetables and ice into smooth drinks full of fiber and vitamins. Available in a whole range of colours and capacities, the NutriBullet is designed to making juicing and blending easier than ever, with all models being easy to use, easy to clean - and dishwasher-safe. NutriBullet blenders feature a lightweight base and patented extractor blades, which are made from the toughest stainless steel - so they never need sharpening. Together with a motor equipped with a unique cyclonic action, it’s enough to tackle even the toughest stems, pulses and seeds. This powerful combo allows you to extract as much nutritional goodness from your fresh ingredients as possible, while delivering the smoothest smoothies yet. Whether you’re a dedicated smoothie-lover, or just looking for a fun, delicious and easy way to add an instant health boost to your diet every day, NutriBullet blenders like the NutriBullet Pro Blender and the NutriBullet Magic Bullet are ideal.